I am going to love Creepy and Maud because I dig strange books. A lot. Yay. And the other one sounds really awesome too. I swear...there is something about Aussie authors that I just love! Creepy and Maud sounds so different. It totally sounds like something I'd go for. Wonderful reviews! It was my pleasure:) What's mine is yours when it comes to books so just let me know if I have something you want to read. I totally had a blast reading Life in Outer Space. I loved Sam's nerdiness but also that Camilla was an actually nice character. I hate when new girls or guys come to school and are instantly AMAZING and popular. (see that annoying guy in Lucid, Lindsay Lohan in Mean Girls, etc.) I liked seeing someone who kept it real and wasn't really fake. C&M was an odd book, it was definitely very, very different and I think it was missing a little something for me, but still a unique book worth reading. 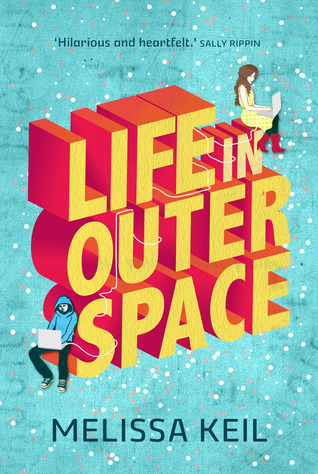 And SO, SO, SOOOOOO happy that you loved Life in Outer Space - it makes my heart sing when I see +ve reviews!!! And you're so welcome, lovely girl! I've been dying to read Creepy and Maude since Shirley Marr posted about it last year---how awesome that you got yourself a copy! I need to order it soon, it seems like it might be my kind of read, despite the reservations you mentioned. I have to confess I was a little on the fence about Life in Outer Space, though. It's certainly been making the rounds, but I didn't know if it would be too "clever," if you know what I mean. Seeing your 4 stars and excited review definitely piques my interest, though! Neither of these books was on my radar, but I definitely want to read Life in Outer Space now! Anytime you use the words cute and fun - and talk about strong character dynamics, I'm in. Also a well written, engaging male POV is always something I want to read. Creepy and Maud: I think I'm going to pass on this novel. I'm not sure how far I would get and I don't think it would be a good idea for me to read a book I'm not sure I'm going to love it. Life in Outer space: you sold me at "As a fan of films, Doctor Who, Lord of the Rings, and most nerdy things." Honestly, when you give a book 4.5 stars AND talk about nerdy things, I'm in need of the book! I have actually not heard about this book at all so I'm glad you reviewed it!